Love Me Beauty has introduced a few new brands into their beauty boutique in the last month or so. 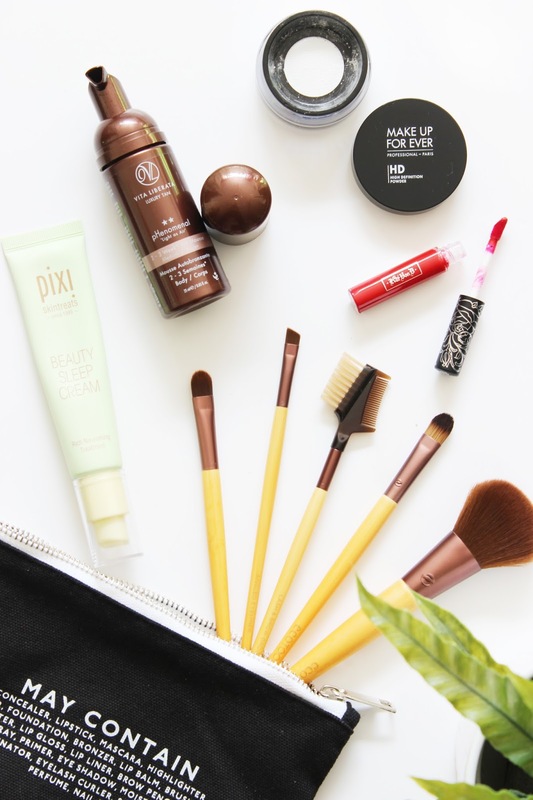 They now offer the chance for fellow product junkies to discover the likes of Makeup Forever and PIXI and last month they added Vita Liberata, Eco Tools, NUXE, Kat Von D and Omorovicza to their all-star line up. LMB have quickly stepped up their game, not only do they have a whole host of hot brands available to try at your fingers tips, unlike most beauty subscription boxes on the market Love Me Beauty allows you to pick your own products using your points. Who said beauty subscription boxes are boring eh?! Arguably I don't need a monthly beauty delivery, but test-driving new beauty products and discovering new brands is kinda my thing. LMB's mix of makeup and beauty products from high-end and emerging brands excites me - not to mention they come packaged in a pretty makeup bag! So today I wanted to share three of my favourite finds from the LMB boutique. Everyone needs a makeup brush set in their beauty arsenal and this six piece starter set from Eco Tools includes the basic; a concealer, eye shading, blush and angled liner brush and a lash and brow groomer. The iconic brushes have recycled aluminum ferrules, incredibly soft, cruelty-free bristles and are vegan friendly. With a little compact pouch to pack the six pieces away, the price is unbeatable for the quality. A classic brick red liquid lipstick perfect for the upcoming months. And a beautiful formulation to match, infused with vitamins A,C and E for added hydration. Long-lasting wear (boasting a full 8 hours) and high-pigment colour with a smooth matte finish. The MAKE UP FOR EVER HD Microfinish Powder doesn't add colour or coverage, but will help your makeup stay in place all day long. The loose powder has an incredibly soft, fine texture and the one-shade-fits-all formulation of 100% mineral silica sets and slightly mattifies, whilst softening the appearance of imperfections, fine lines and pores. But don't be overzealous during application, otherwise you'll look as though someone's slapped you round the face with a chalkboard duster! Full sized this stuff is pretty pricey, but rightly so. After slathering myself in the non-scented fake tan, I was left with a beautiful instant glow. It dried super fast more so than my favourite Cocoa Brown 1 Hour Instant Tan, didn't require a crazy amount of buffing and doesn't leave you looking like a zebra. And as of right now I can't vouch for the 2-3 week staying power. But I'll be sure to put it to the test! Whilst it won't take place of my richer night cream, Pixi Beauty Sleep Cream has been a nice addition during warmer weeks. The silky, fast-absorbing, lightweight, nutrient-rich cream feeds, calms, conditions and normalises my skin while I sleep. It's great for those of us with combination complexions, as it tends to dry patches yet isn't greasy. And come morning I wake up to wonderfully soft skin. Use 'em20' for 20% off your first LMB order. What's the best product you've received in a subscription beauty box?